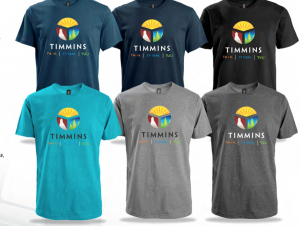 The Timmins brand is coming to a store near you! Our brand story is that Timmins has a wealth of opportunities that centre on our many different resources – human, natural, knowledge-based and cultural. This brand story honours our past, but keeps us open to the future. Alfie’s Cigar Store in down town Timmins and Wicked Stuff in the Timmins Square will now carry Timmins swag. 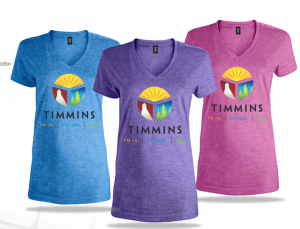 What better way to share your community pride than by wearing a great Timmins shirt! Products like these help increase brand awareness and spread the word that Timmins is a great place. They can also rally the community around a central image that builds pride and unity. Our new brand can be a powerful influence on perceptions, intentions and behaviour, and it’s important for Timmins to have an attractive logo that offers some “wow” factor to residents and visitors.